17 July 2012, Keelung, Taiwan - Lian-Li Industrial Co. Ltd, today announces a tall, slim brushed aluminum EATX supported chassis – PC-X2000FN. The PC-X2000FN keeps DIY builder's hardware neat and organized in the interior with its three separate compartments, while having a sleek, elegant feel on the outside thanks to the one-piece front panel with no visible vents on holes. 693mm (27.3”) tall and 240mm (9.4”) wide, the PC-X2000FN lets DIY builders install the hardware they desire in a neat, organized and compartmentalized fashion. The top section holds 5.25”, 3.5” and 2.5” drives. The middle section is for motherboards up to the EATX form factor, and has plenty of room for cable management thanks to the rubber grommets and generous space behind the motherboard tray. The bottom compartment holds the power supply as well as an additional 3.5” HDD cage. The PC-X2000FN holds up to seven hotswappable 3.5” hard drives - four 3.5” HDDs in the top compartment and three 3.5” HDDs in the bottom one. A 2.5” hard drive cage allows users to install up to three SSDs in the top compartment. For even more storage capabilities, two additional 3.5” HDD or a 3.5” and a 2.5” can be installed in the middle compartment. The two 5.25” bays in the top section face the side panel rather than the front helping to add to the sleek external aesthetics of the PC-X2000FN. The middle section is the roomiest by far. Thanks to the other hardware being compartmentalized in the sections above and below, DIY builders do not need to worry about space limitations for expansion cards and CPU coolers. CPU coolers up to 180mm (7.0”) in height and expansion cards up to 340mm (13.3”) in length fit comfortably. Also, the ten expansion slots with tool-less latches to secure cards into place, give this tall, slim chassis plenty of room for future expandability. Power supplies up to 230mm (9.0”) in length can be placed in the bottom compartment. Ventilation slits underneath the PSU with a removable pull-out filter help increase the life and performance of the power supply. The front panel is all one piece with no vents or holes giving the PC-X2000FN a sleek, elegant look. Since there are no vents on the front panel, cool air is pulled in through vents on the front of the side panels by three 140mm fans. To ensure long hardware lifetimes, a slide-out washable air filter located in front of the fans keeps out dirt and dust. One 120mm fan in the rear of the middle compartment and one 140mm fan in the top compartment blow out excess heat. The built-in fan controller helps DIY builders find the balance between silence and cooling. This elegant brushed aluminum chassis has many other features that DIY builders can appreciate, including: easy-to-remove pop-off panels for simple installations and upgrades, water cooling support and sturdy aluminum feet with rubber bottoms to reduce vibrations. 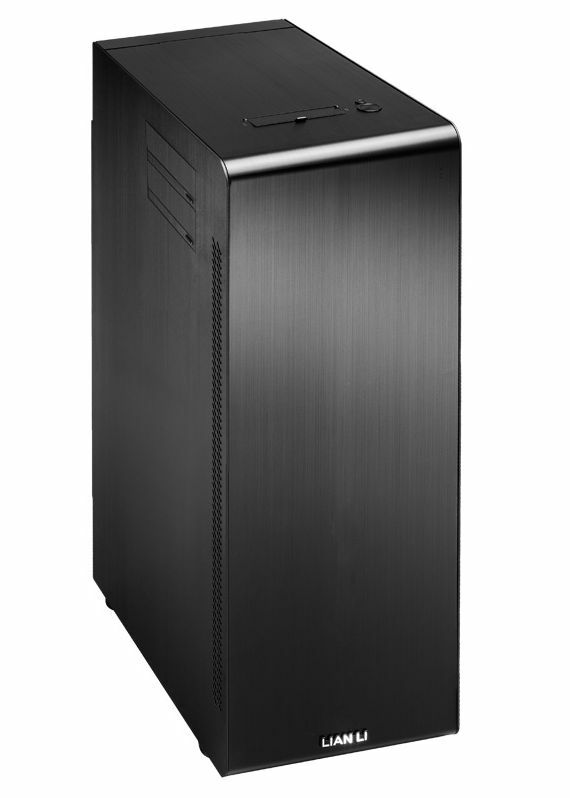 The PC-X2000FN has an all black interior and exterior and is available for the suggested retail price of US$499.